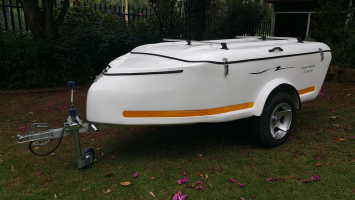 Sherpa Leisure manufacture and sell small, light-weight fibreglass caravans and boat related services in South Africa. The Sherpa Tiny and Sherpa Tiny RoughRoader are extremely easy to tow and light to manoeuvre. 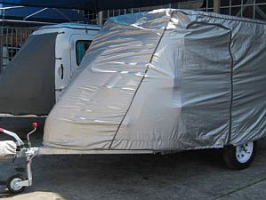 All the Sherpa caravans are made of fibreglass so there are no problems with wood rot. 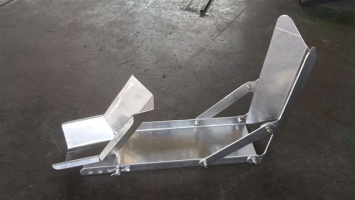 The chassis are galvanised. The Sherpa caravans are built to order. They can be modified to suit various requirements. 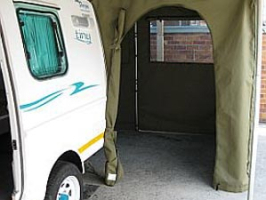 Our main market is private leisure, but our Sherpa Tiny has also been customised into a mobile hearing clinic, including a ramp for wheelchair access. 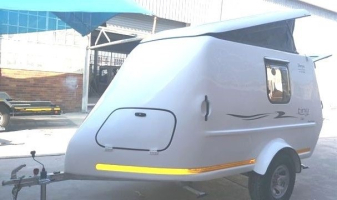 We have manufactured a caravan for a camper in a wheelchair (see article 18), as well as one where the bed folds back against the side to allow for packing goods or transporting a motorbike. We are able to fit a power mover to the caravans for easier manoeuvrability. The standard colour is white, but alternate colours are available as an extra. All the Sherpa Caravans come with Microdot for your security and peace of mind. We have now launched the Sherpa Tiny "Lite" & "Lite HiRider". 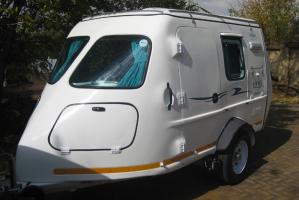 Over the years we have constantly developed, added and improved our Sherpa Tiny caravans to make them a better product. 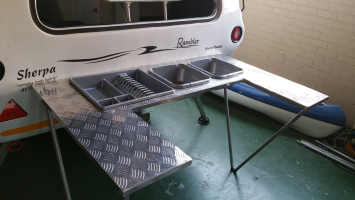 We offer a host of optional extras and do a lot of customisation. We have decided however to go back to basics and launch our Sherpa Tiny "Lite". 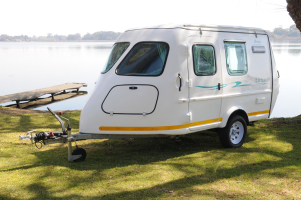 There is a big demand for a small, simple caravan that is more affordable. It is based on the standard Sherpa Tiny but it only has a rear door and no side door. The front windows have been eliminated and extra cupboards have been put in their place. The bed layout is 2 single beds and a 220v pub fridge is provided. There are no overrun brakes. The roof hinges on the front and lifts up at the back. There is also a small canopy at the back. 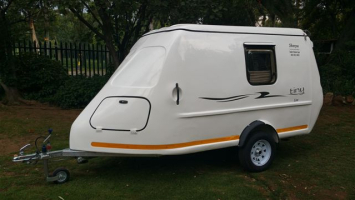 This caravan can be towed by a small car with a code B drivers licence as the GVM is 750kg. The Sherpa Tiny Lite HiRider has bigger wheels and a spare wheel swing bracket. Our larger gravel road caravans, the Sherpa Rambler standard edition and bathroom edition have the choice of 3 interior bed layouts. You have the 2 single beds with the addition of a centre table that converts it to a full bed. French bed which gives you a 1.4m wide bed on the LHS of the caravan with cupboards on the RHS. Side to side bed which gives you a 1.4m wide bed positioned across the width of the caravan. See articles that have been published about our caravans under the News tag. Sherpa Leisure introduces the new Sherpa Tiny Lite Hi-Rider edition. Based on the Sherpa Tiny Lite, as its name implies, it sits higher off the ground, weighs less than 750kg and is still unbraked. 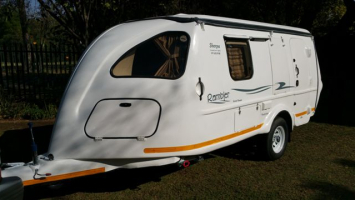 Like the standard Sherpa Tiny Lite it includes a 220v pub fridge, rear patio, 2 x mattresses,4 stabiliser jacks, step, LED ights and spare wheel, but the Hi-Rider edition comes with 15" wheels and a spare wheel swing bracket. Please call Sherpa Leisure for more information. I am interested in the "The new Sherpa Tiny Lite Hi-Rider"